1 Why Should You Test Your Soil? 4 Where Can I Get My Soil Tested For Free? Most people know what their plants need to thrive. But how will you know if your garden has everything it really needs? Test the soil, of course! And yet there’s so many test types available. How should you choose? 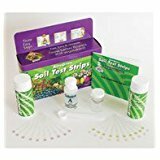 I’ll help you sort through the different types of soil test kits that are on the market today and find the best soil test kit for your needs. Better yet, I’ll explain all about testing your soil and how to do it. Just like people, plants have particular nutrients they need to grow. In fact, every box of fertilizer has a list of the most common ones – nitrogen, potassium, and phosphorous. There’s also other nutrients, like calcium, which are essential to healthy plants. When you first start to garden, it’s important to test your soil to know what you’re working with. That way, you can amend it to suit the needs of what you want to grow. Without testing, you won’t know if your base soil is already just fine and ready to go, or whether it’s going to require a lot of blending with other materials to improve it enough to be fertile. You may find you don’t need to fertilize at all. Over-fertilization can actually cause problems with your plants, causing them to grow erratically. Root-forking is common in carrots that have been over fertilized, for example. Nobody wants a three-legged carrot! But if your soil is lacking nutrients, you need to be aware of it so you can repair that. You’ll need to know the pH of your soil as well. Too alkaline or acidic soil will not produce good growth results. While all plants are different, and require different levels of acidity or alkalinity, most like a neutral range. If you don’t test your soil, you simply can’t determine what you’ve got at hand. And how are you going to guarantee the best growth your plants could possibly support without knowing? So you know why you should test. Next we’ll go over what you need to test. Some of these things are more important than others, so let’s dive in! Most fertilizers have an NPK rating. That string of numbers tells you what the ratios of nitrogen (N), phosphorous (P), and potassium (K) are in your fertilizer. But what you don’t know is whether your soil has too much potassium to start out. It’s important to test your soil prior to adding additional fertilizer. After all, if you have a nitrogen-dense soil, why add more to it? There are chemical tests which have varying levels of accuracy on P and K, but most tests tend to be inaccurate on nitrogen. Nitrogen tends to be somewhat mobile in the soil, and can also become patchy. It’s also heavily used by plants as the primary ingredient to spur leaf and stem growth. Even soil test facilities have a hard time measuring nitrogen well! Phosphorous spurs fruit and flower growth, and is essential to folks growing tomatoes or other fruits and vegetables. Too much of this nutrient can cause a plant to put out an overly-large number of flowers. It might look beautiful while they’re in bloom. But for anything that fruits, you may be creating a lot of future stress on the plant. Potassium is the root-developer. Without enough potassium, root systems may stay small, curtailing the plant’s eventual growth. Too much potassium may be a problem for people who’re growing root crops, as it can cause misshapen roots. While the majority of commercially-available home soil test kits don’t test for anything behind the basic NPK list above and sometimes soil acidity, there’s other nutrients that your plants need for continued growth. Some of those include calcium, magnesium, iron, zinc, and more. There’s also other more ominous things that can be tested for, such as lead or an abundance of sulfates from ice melts. While some of these can be in even healthy soil, too high of a lead content can be a risk for you or your kids. Sulfates can stunt growth in some plants if the levels are too high. Don’t forget to test the acidity or alkalinity of your soil! Most plants prefer a neutral soil pH, somewhere between 6.0 and 7.0 being the ideal range. However, a few plants like their soil more acidic than that. 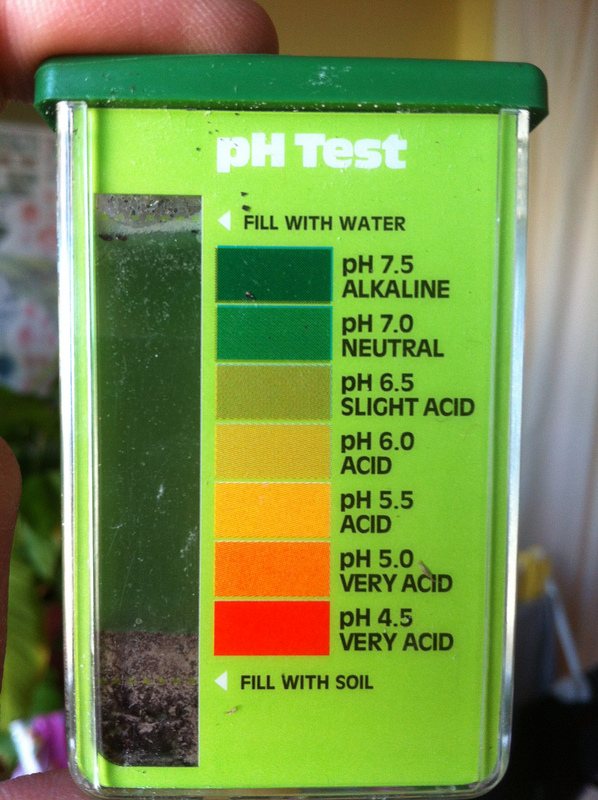 Depending on what you’re growing, you may need to adjust the pH of your soil. Testing of soil pH can also widely vary, but you can get a basic concept of your soil pH, which is good enough for most home gardeners. Adding products like lime or calcium to your soil may have effects on increasing or decreasing your soil’s pH level. We’ve come a long way from having to taste-test our soil to determine alkalinity or acidity. That’s what early farmers did long ago, well before contemporary test methods. A soil that tastes sour is likely acidic, one which tastes sweet is alkaline. Either way, you’d still have to eat dirt, which makes modern methodology a whole lot easier (and better tasting!). 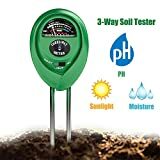 Depending on the type of tester that you are using, it can be as simple to test your soil pH as sticking a probe in the ground. Chemical testers are also available in varying amounts of efficiency. If you’re using a chemical pH tester, follow the manufacturer’s directions. The process usually involves adding a small bit of soil and water to a test capsule or other testing colorant, which will help you to determine your approximate pH. With a digital pH tester, make sure it’s set to test pH and not anything else, as some can test sunlight levels, soil moisture, or NPK content as well. Then press it into the ground to the required level per manufacturer’s instructions. Most testers with a LED screen will register the level within about a minute. A gauge tester will usually register the level in 10 minutes or less. While I briefly touched on it above, there’s three basic types of soil testers: chemical, digital, or an outside professional service. Let’s go over some more detail on these. Most chemical soil testers are quite straightforward. Place a small amount of soil in a vial, and add water to fill, then drop in a colored capsule that matches the vial’s lid color. Each color corresponds to the soil nutrient that it is meant to test for. Shake it, and then wait per manufacturer’s directions. The color of the liquid inside can then be compared to a chart which will help you get a rough estimate of the levels of that nutrient. Slightly more advanced versions of these require you to add a drop to a few drops of a chemical reagent from a vial, but those come with more thorough directions and a selection of options to test for. While these aren’t necessarily the most accurate tests on the market, they will give you a reasonable indication of what you need to add to your soil. With a chemical soil test kit, you’re going to have a limited number of uses based off how many capsules or vials of reagent come with your kit. It’s expected that once you’ve used those, you dispose of the kit and replace it with a new kit. This prevents aging of the plastic vials and ensures you’ll have fresh testing agents. Here’s a short video on one form of chemical soil testers, so you can see how the process works! Digital soil test probes are a bit more finicky than chemical ones. These units usually use an electrical charge to test for certain levels of a given soil component, and thus often require batteries. Prior to using your digital soil tester, and once you’ve completed using it, be sure to thoroughly clean the probe or probes with alcohol or soap and water. Some professional-level kits include special cleaning solutions which ensure that all particles of soil are removed from the tester’s surface. This ensures that it’s ready to use the next time you need to run a test. If your digital tester comes with vials, it is meant to be used with a slurry of soil and water inside the vial, and sometimes has an added chemical component. Generally, it’s best to use deionized or distilled water for testing purposes. It will give you a slightly more accurate result. Other digital testers are meant to go directly into the soil. These testers are slightly less accurate than the ones with vials, but for a quick soil test are quite easy to use. With this kind of soil tester, you’ll need to clean the probes after each test, and you may need to test multiple areas. Most of the digital test kits on the market today are oriented primarily towards gauging pH levels. 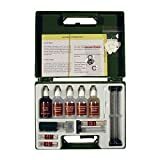 If your interest is in the macronutrients in your soil, you may need a chemical kit. The most accurate form of soil testing is done by professionals in a lab setting. Scientists have multiple pieces of lab equipment at hand that ensure you’ll get an accurate portrayal of what’s in your soil makeup. However, even professional soil testing relies on your accuracy in harvesting the soil samples. You will need to take samples from multiple spots and blend them thoroughly together, then allow them to completely dry out. At that time, you can take it to the lab or mail it. Once it arrives at the lab, they will do a series of tests. These have a much higher accuracy level for potassium and phosphorous. Labs can also test for micronutrients in the soil which other commercial kits don’t test for, such as sulfur, manganese, zinc, copper, calcium, and many more. Even these tests are prone to having varying levels of accuracy, but that’s partially because of the nature of soil. In a patch of soil, you’ll find pockets of different nutrients, and areas where plant roots are located may be less nutrient-rich than places where they’re not. A prime example is nitrogen. Since it’s transient in soil and is quite water-soluble, nitrogen has a tendency to be difficult to test for. They can identify how much nitrogen is in your soil sample, but that doesn’t mean it’s at those levels throughout your entire yard. However, with professional soil testing, they can make recommendations for amendments based on what plants you intend to grow in the area of your soil sample. One of the good things about a professional test is that they also analyze the makeup of your soil. You can learn exactly how much organic material, sand, silt, or clay is in your growing medium and use that to help build up the soil from there. There’s a lot of benefits to professional testing, but if you’re looking for a quick result, that’s not one of them. Often, it can take a week to a couple weeks to get your results back, so you’re stuck waiting for a bit. The video below will show you how to read your soil test results if you opt for professional testing. This is a basic macronutrient test. Most testing facilities offer more thorough tests for an additional fee. Where Can I Get My Soil Tested For Free? Many local agricultural extensions of colleges offer soil testing services. For some areas of the United States, it’s as simple as stopping by your local library and picking up a soil sample box. You then acquire the sample per the instructions inside the box, and drop it off at the test facility. However, not every ag extension offers free testing services. You will need to check in your area to see if these services are available to you. Sometimes there is a small fee for mailing your results or for the chemicals that are used in the process of testing. It’s usually quite reasonable for the level of data that you’re getting! You can do a very rudimentary home pH test with just a few simple components. You’ll need your soil sample, two clean containers, some baking soda, some white vinegar, and some distilled water. Split your soil sample into the two clean containers. You’ll want a couple of spoonfuls in each, as it won’t take much soil to run the test. In one of the containers, add a half cup of white vinegar and watch the result closely. If there is any bubbling or a fizzing sound, your soil is alkaline and needs more acidic content to bring it to a neutral soil state. In the other container, add half a cup of water and loosely mix it together with the soil. Then add half a cup of baking soda. As before, if the soil fizzes or bubbles, you have your result, but in this case, your soil is acidic and needs more alkaline matter to bring it to neutral. If neither test results in a response, you’ve got nice, neutral soil. While this test won’t guarantee that the soil is optimal for your specific types of plants, it does give you a good starting point, and you can fine-tune later with more advanced testing options! Finally, let’s decide what’s the best soil test kit for your needs. In this section, we’ll go over the top of the line soil testers for home use and offer some insight on those. We’ll go over a couple professional soil testing companies as well. 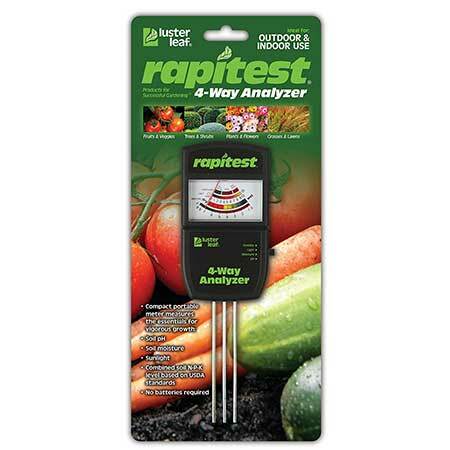 For being a premium kit, this Rapitest soil test kit is actually quite a bargain. With 80 possible tests you can do, this kit measures pH, N, P, and K. It doesn’t offer micronutrient testing, but most home kits don’t, so that’s unsurprising. Instructions are a step-by-step guide to how to perform these tests. You’ll need to have a little patience, as it can take some time for your test results to appear, but it’s still quicker than sending soil off to a lab or extension office. It comes in a sturdy plastic carrying case, and refills are available for the different test agents. If you just want an overall home test, this is the best soil test kit I can recommend. To me, this one even has better results than the digital kits. But you will need to have a steady hand to extract the right amount of chemical agents from their vials. You might feel a bit like a mad scientist, too! But overall, I can’t recommend this kit highly enough. Get one for your garden supply cabinet. 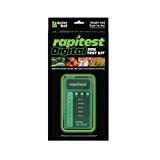 The 1605 Rapitest soil test kit combines chemical NPK macronutrient testing and pH testing with a digital reader. For people who find the shaken chemical kits to be difficult to read, the digital reader is a godsend. Like most tests of its sort, the Luster Leaf 1605 isn’t a replacement for a full lab test from an ag extension or pro lab. It’s simply a good, fast home option. Refill capsules and test tubes are available for your reader. You won’t be stuck purchasing a new reader every time! However, you’ll want to be sure to keep your digital reader as clean as possible to keep it functioning optimally. For a new gardener, or for an old hand who just simply hates color-matching against a badly-printed chart, this is a great choice. I consider this to be an overall second best soil test kit amongst all the choices, and definitely a good pick. This soil pH meter may not test for macronutrients or micronutrients, but it tests for something equally as important. Without balanced soil pH, your plants just won’t thrive. Meant to be used as an in-soil probe, you’ll need to clean the probe wand after each use. The 1847 tests the pH at plant root level. Simply take your clean probe and insert it at the base of your plant, deep in the soil. Then wait, and the screen will show the level once the test is complete. It also has a database of popular plants and their preferred pH levels built-in. Trying to optimize for each plant? This unit will help you do just that! I’ve got one of these, and I have to say, it has both its pros and cons. Overall, it’s one of the best soil test kit purchases I could have made, but it’s no match for some of the other options above. Let’s look at it in detail. Unlike all the other units mentioned so far, this unit measures sunlight levels along with macronutrients, soil pH, and soil moisture. However, I find that its macronutrient test is hit or miss. It doesn’t sample individual macronutrients, so you can’t tell how much nitrogen is in a given location. Instead, it does an overall “soil fertility” test which senses NPK in the soil and averages them together. That works just fine for plants that like a balanced fertilizer, and you can easily identify your baseline fertility. But that doesn’t work as well for heavy feeders on nitrogen, or for encouraging heavy blossoms on your flowering plants, etcetera. So for macronutrient testing, this is in no way approaching a pro lab test. For soil moisture it’s phenomenal. Sunlight levels are great tests too, especially if you’re setting up a new garden and need to know how much light your plants will get. And the pH tester seems to be accurate enough for me! It’s hard to compare commercial-level professional labs, but Soil Savvy is a very popular and highly-regarded option. All pro labs and agricultural extensions do essentially the same series of tests, and thus have similar results. Soil Savvy is just a bit faster at getting those results back to the person who needs them! Soil Savvy tests for both macronutrients and micronutrients. Nitrogen results show as the total nitrogen in the sample as well as showing levels of both nitrate and ammonium. In addition, the tests give results for phosphorous, potassium, calcium, magnesium, sulfur, sodium, iron, manganese, zinc, copper, boron, and aluminum. If you want a kit that will also make reasonable fertilizer recommendations for you, Soil Savvy should be your choice. It will offer recommendations for both organic and synthetic fertilizer types, as well as a recommendation of how much fertilizer you should use to improve your soil at its current level. For those new to soil testing, this is a great perk, and worth the money. Those who’ve got experience with soil testing already may be able to just go to the ag extension where it will be cheaper or free. Even then, the fertilizer recommendations are handy and worth it overall. Widely available, this is the classic home chemical kit. Simply put a small sample of soil into the tube side of the box, add some distilled water and the appropriate reagent capsule, and shake it up. Let it sit until the color has fully developed, and match it against their color chart. You’ll find variations of this type of test kit available elsewhere as small tubes. However, what the 1601 can offer that other kits lack is an attached color chart. There’s no fear of losing your color chart with this soil test kit – it’s right on the test unit itself. Each test box handles one of four tests: pH, N, P, or K and can run ten tests without a refill package. It’s never going to be as accurate or detailed as a professional testing would be. But, if you’re just looking for a baseline reading, this is a great and inexpensive option. I’m not a huge fan of test strip kits. Their accuracy isn’t pinpoint; it’s more of a range, so you may still need further testing. But for ease of use, they’re high on the list. Simply mix some soil with distilled water, shake it up, and put your test strip in. When you pull it out, your base reading is visible. It’s a little easier to read than the Rapitest 1601, but when I say a little, I should probably say “only a tiny bit easier”. Your comparison chart is separate from the test unit itself, so you have to make sure you don’t lose it. But you can get the two color strips side-by-side for the closest estimate your eyes can see. Overall, while this is useful for a baseline, it’s not going to be as useful as a professional test. But if you just need an estimate so that you know if you need that pro test, this is a great choice. 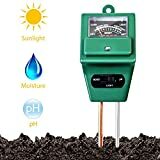 This unit measures pH, soil moisture, and light. Not fancy, nor likely to win any awards for its high level of detail, it functions and does precisely what it’s meant to do. 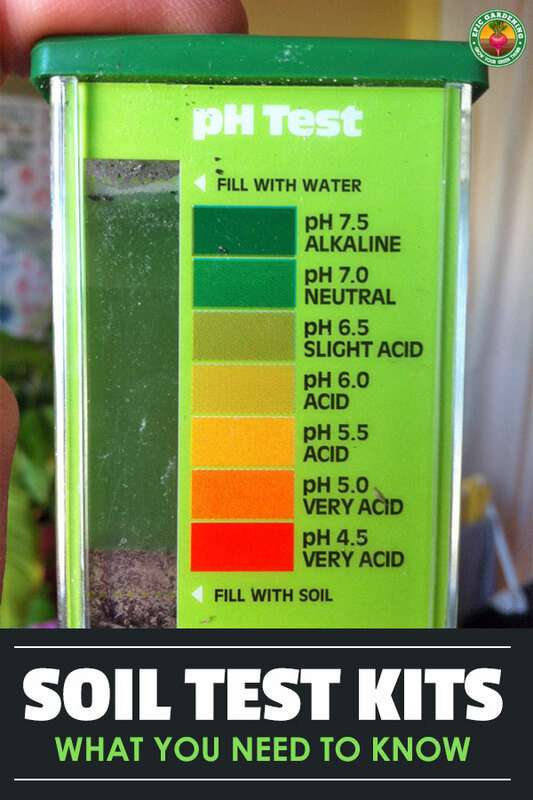 For those who need to check their pH level of their soil regularly, this is a good, basic unit. The sunlight sensor on this unit is positioned on the front center of the device, and it’s an odd placement. I find that a sunlight sensor on the top of the unit is more accurate. But for the price, you can’t beat it as a basic pH reader. This, like the 3-Way tester above it, is another in-ground pH, moisture and light tester. It’s an old design, and honestly, it isn’t my favorite device. I find that the meter’s visual pH ideal is set too high with a 7-8 soil pH as “optimal”, when realistically you’re aiming for a pH of 6-7 for most plant growth. 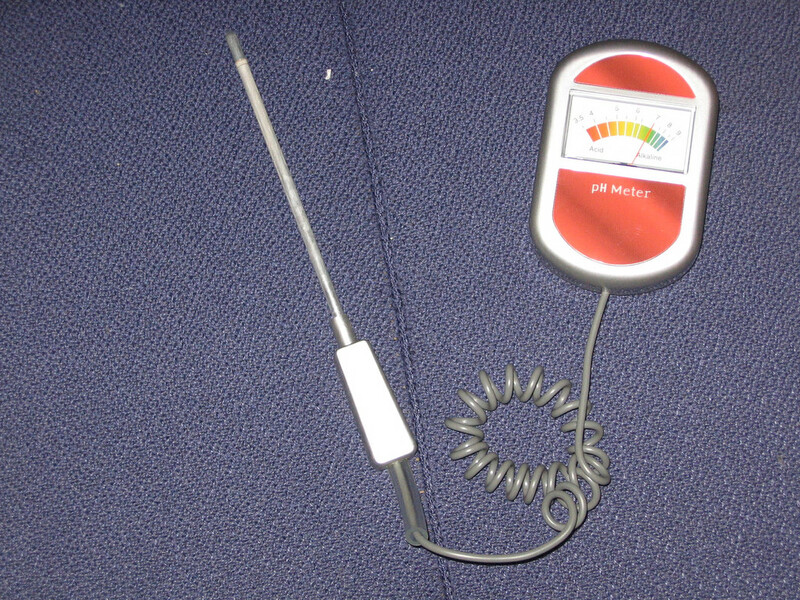 However, for an inexpensive pH meter, it still gives you a reasonable indication of your soil’s acidity or alkalinity. Like the one above it on our list, the sunlight sensor is positioned oddly. But where this device excels is at moisture indication. This really helps with ensuring you’ve got the right moisture level for your plants, not too wet nor dry. Both of the 3-function soil testers we’ve mentioned take about 15-20 minutes to reach their most accurate range. Even then, it’s a range, and definitely won’t replace a professional testing. Finally, we reach our last test, and it’s a commercial lab test kit. Whitetail Institute offers a free consultation about your soil with the purchase of your kit. The consultation is a very short one on the phone which mostly breaks down your results into layman’s terms. You also receive a full report with detailed breakdown of your soil nutrients. However, where Soil Savvy offers a pre-paid shipping envelope, Whitetail Institute does not. You will need to not only purchase the test, but you’ll need to pay to ship your soil sample. Given the price of the test, it seems a bit counter-intuitive to not have shipping included. The results, however, are thorough and definitely worth having. You can get similar results at your local ag extension, but if you don’t want to hunt that down, this isn’t a bad choice of lab to go through. There you have it, my breakdown of the best soil test kit choices available to you at the start of 2018! Knowing your soil means that you know what you have to do to coax the best plants from it. 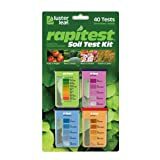 I encourage you to pick up one of these kits and test your soil before the spring planting season comes! Have you used any of these kits before? Do you find that you test pH or macronutrients more often? Does your local ag extension still offer free testing? Tell your stories in the comments below! This is a great review. Quite professional. I loved it. Thanks a lot. I think based on this review, I can be able to settle on Soil Savvy. Perfectly fits my circumstances as an extension worker or Agricultural Advisory Service Provider. No problem Robert, glad you got value out of it!